1. 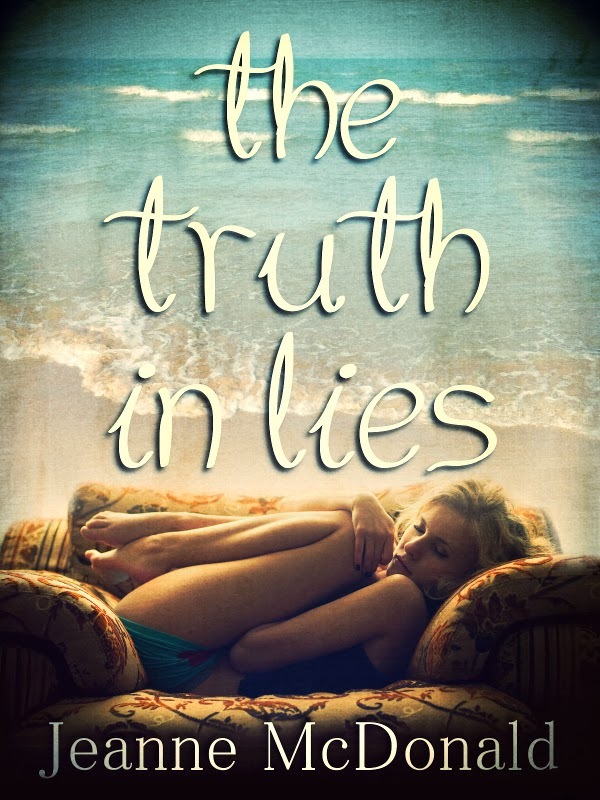 Tell us about your TRUTH IN LIES SAGA and a little about what is planned to come. The Truth in Lies is about facing adversity and overcoming all obstacles. It’s also about finding love where you least expect it, and allowing yourself to be loved no matter how much you feel you don’t deserve it. 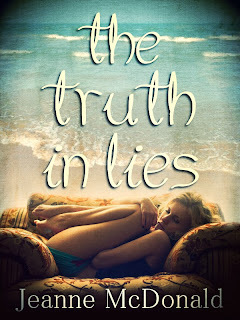 At the moment, I have a total of four books planned for The Truth in Lies Saga. 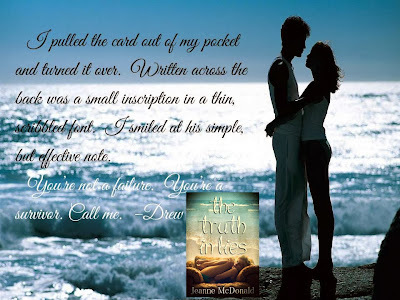 Book one, The Truth in Lies, is told entirely from McKenzie’s point of view. We see the struggles she faces after miscarrying her child and finding love and friendship in a man that’s off limits. Book two, The Certainty of Deception, is a continuation of the story but will be told from Andrew’s point of view. Drew has secrets that none of us could begin to imagine. For a man so young, he’s seen tragedy beyond his years. We’ll dive deeper into his struggles with alcohol and see what makes a Neanderthal tick. 2. How did the inspiration for this evolve? Music is a HUGE catalyst for me. The song A Different Kind of Pain by Cold is a breakup song where the artist is begging for a second chance because he can’t handle the thought of seeing the one he loves with another. Not that I’m a jealous person, per se, but I could easily imagine the pain of having that one person, the one you know you were destined to be with, walk out of your life forever. Well, with that thought in mind, the story sorta shaped itself. 3. How many hours do you try to spend a day at the keyboard and is there a “must have” in your workspace while you are typing away? Time isn’t really a constituent for me. My goal is to write at least 500-1000 words a day. They don’t have to be good, but in my experience, when I allow myself to simply write, the best stuff happens to appear. There are two things I require when I write. The first is my iPod. My slogan: Never Write a Word Without It. The second is an open chat window with my best friend, Penny. She’s the best brainstorming partner a writer could ever ask for, and she has no qualms knocking me upside the proverbial head when necessary. 4. Do you like music while you work or silence? Music. Absolutely music. I’m an emotional author and music tends to tap into that emotion. 5. What is your favorite and least favorite part about being an author? Hmm. I’d say my favorite part is a two-fold answer. The first part is getting to see my characters come to life on the page. I have all these people living inside my head (yes, I realize that makes me sound crazy, but any writer will agree with me. A writer’s characters have a life of their own that lives deep in the psyche of the author. LOL), and it’s a joy to watch them evolve and become the people I know they were always meant to be. The second portion of the answer is the wonderful people I get to meet. I’ve made so many great friends with fellow authors and with my readers. Those are relationships that should be cherished, and believe me, I do. My least favorite part of being an author? Dang, that’s a toughy. I’d say it’s keeping an open mind. I have a vision for how I see my characters but my editor doesn’t always agree with me. However, I’ve discovered that her insight is invaluable and even though I struggle to keep an open mind, when I do, my stories are always better for it. 6. Having a mild Starbucks addiction, what are your top three picks when you indulge? Just three? Oh, my. My number one pick is a salted caramel white chocolate mocha. It might be a mouthful to say, but it’s Heaven in my mouth. Of course, the drawback to such a delectable treat is the added mile to my morning run. My second pick is the pumpkin spice latte and third is the caramel macchiato. Truthfully, the list could go on and on. It’s pretty bad when my baristas know me by name and drink. 7. When you were younger you wrote poetry, do you still like to dabble in it or are you strictly a novel writer now? To be honest, I was terrible at writing poetry. I still have a journal full of it, but I refuse to show anyone because, damn, it was bad! LOL. Storytelling has always been a passion of mine which supersedes all other writing forms. I was once told that I have a knack for conversational writing and that I should consider penning a screenplay. Who knows, maybe one day, I will. 8. What are you currently reading and tell us the next three books on your TBR list. Currently, I’m reading The Marriage Bargain by Jennifer Probst. I’ve really only started it, but what I’ve read thus far is wonderful. The next three books on my TBR list are the Divergent series. I absolutely loved The Hunger Games, and I can’t wait to sink into another dystopian story. 9. To help us get to know a little more about you, tell us a few facts that readers won’t find on your website. Let’s see. I’m the mother of an autistic child, which is the inspiration behind McKenzie and Jared’s occupations in The Truth in Lies. I’ve only ever lived in the state of Texas. I’ve never travelled outside the continental United States. As a young girl, and into my early adult years, I not only won singing competitions, but I also won speech competitions. In high school, I took classes in electronics to be near a boy. That boy, in later years, would become my husband and the father of my son. And last, but not least, I have an insatiable obsession with Harry Potter. It’s to the point that I have a Harry Potter tattoo. Yep, that’s right. It’s the Deathly Hallow’s emblem shrouded by two phoenixes. Cool, huh? I think so. Synopsis: Life is a sequence of choices. Some are deliberate, others are forced upon you. This was a lesson that McKenzie Evans knew all too well. After the miscarriage of her son, she made the hard decision to leave her absentee boyfriend and move in with her former college roommate, Olivia Hamilton. That’s when she was introduced to Andrew Wise, a brilliant attorney, working for his family’s law firm in Sarasota, Florida. Excerpt: He leaned forward on his hands, one knee placed on the sofa into a near crouching position. His back arched high, lifting his t-shirt up to expose his succulent muscled stomach as he moved toward me. “Andy, whatever you’re thinking, stop thinking it,” I warned him, scooting away from him. He dropped his flip-flops onto the floor, his eyes wild and playful. He inched forward, placing both knees on the couch. I pushed myself up against the arm of the sofa, holding my knees to my chest. “Really, Andy, stop it now,” I screeched in a high pitch shrill. Drew lunged for me, catching me by the leg. Dragging me underneath him, he pressed his body against mine, holding me in place. I flattened my hands against his shoulders pushing him as hard as I could, breathless by the amount of weight he was enforcing on me. Without warning his fingers made contact with my sides. I squirmed against his ministrations as he started to tickle me. “Andy…no…stop…please,” my words came out as mere breaths. Drew encircled my legs with his, holding them to the surface of the cushions. With one hand he tied my hands above my head while his other continued to torture my ribs. I was his prisoner; unable to disentangle myself from his prowess. “I never lose, and if I somehow do, I always get my justice,” he whispered huskily in my ear. I wiggled and squirmed, squealing in laughter. With each movement of my body my shirt would rise, but so would his. Our bare skin pressed against each other as perspiration began to build. Electricity crackled around the room. Our breathing became heavier and deeper. His hand reached between my knees, tickling inside my leg. I bucked and kicked in efforts to escape his relentless torture. The atmosphere in the room shifted. What was playful banter had changed into heady desire. He released my hands, and brushed my hair back from my face. Every nerve in my body felt where our skin met. My hands slipped between us, pressing against his sculpted chest. His heart raced against my fingertips. His hand slid over my hip leaving a trail of heat in its wake. “Mickie,” he whispered my name like a sincere prayer. A deep moan escaped my lungs as his fingers glided over my rib cage. The thin fabric of my tank top wasn’t enough to eliminate the heat of his hand from penetrating my burning skin. His eyes fluttered closed. A throaty groan rumbled from his chest. His thumb breezed along the curve of my breast. I shivered in excitement. The pressure of his weight burrowed down on me. Every ripple of his stomach, the firmness of his arms, the muscles in his legs, they all encompassed me. His eyes open and a tender smile caressed his lips. “You’re so beautiful,” he murmured. 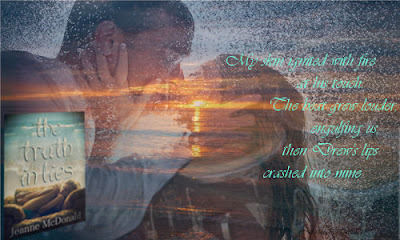 I was intoxicated with the smell of his breath washing over my face. I closed my eyes in anticipation of our lips touching. His hand reached up and cupped the side of my face. His fingers crowned the back of my head, pulling me closer to him. I could feel the effects of his kiss even before his lips touched mine. Author Bio: Jeanne McDonald began telling stories at the ripe young age of five, when her mother considered the truth to be a lie thanks to her extensive embellishment to the retelling of an event. She wrote her first short story when she was twelve years old, and at the age of sixteen she tried her hand at poetry. She reconnected with her love for writing in 2010 thanks to the encouragement of a dear friend. Her passions include a “mild” Starbucks addiction, music, quotes, movies, and romance. When she is not spending time with her family, she can be found reading, writing, chatting with her friends or diligently working toward her bachelors degree in Speech Pathology and Audiology. A proud Texan, she currently resides in the Dallas/Fort Worth area with her family. Thank you, ladies. I had a load of fun visiting with you, and look forward to chatting with you again soon.